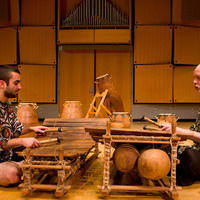 World Music Ensembles at LMU present a spring concert of music from Bali and Ghana in Murphy Recital Hall of the Burns Arts Center. The group will be playing instruments known collectively as “gamelan” from Indonesia as well as drums from the Ewe- and Dagomba- speaking regions of Ghana, West Africa. The program also features Ken Aiso and Yoshika Masuda as soloists in the performance of a work by Lou Harrison for violin, cello and gamelan. We are especially pleased to share this collaboration with two distinguished members of LMU Music’s artist-faculty to commemorate the 100th anniversary of the year of Lou Harrison’s birth. Don’t miss this opportunity to expand your cultural horizons through music and dance. Admission is free—friends and family (of all ages) are welcome!